Alright let’s cover the basics of contract graphic design. Maybe the best way to tackle this subject is to split the type of graphic design projects into two separate categories. The first we call “graphic mastering”, this is where we take your art and get it into a suitable file condition for screen-printing, embroidery and so on. The second type we’ll call “creation from concept” this is where we actually render the art from a concept, this could mean drawing or laying graphics out from scratch. We bill graphic design work hourly and set the rate based on complexity of the design. Most projects range between $40 – $60 an hour. We’ll talk about graphic mastering and creation from concept separately and finish it up with some basics on hiring and working with a graphic designer. But one thing before we get too far along, let’s very briefly define resolution. The metric we use to measure resolution is DPI or Dots Per Inch. The standard for high resolution as it pertains to bitmaps is 300 DPI. Now I could go on for hours about how resolution works and why it’s important in screen-printing and embroidery but I’ll spare you. Just know this, if your file was ever saved as a lower resolution there is no way to get that information back without regenerating it. You can’t just go to your graphics software, save it as 300 DPI and call it high resolution. Above is an example of a graphic we worked on for Garfield High School here in Seattle. 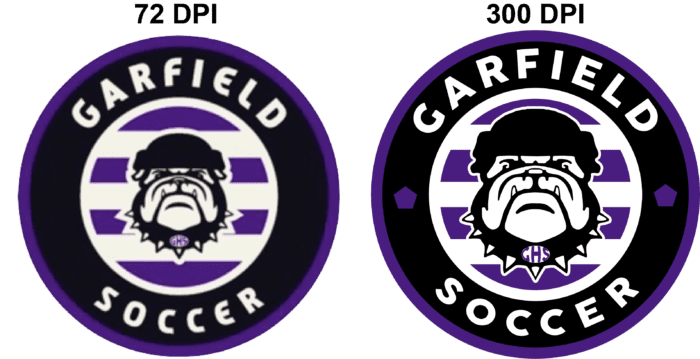 You can see the difference between the file they sent at 72DPI and the file we mastered at 300DPI, this project required some redrawing and additional elements but in all it was relatively simple. If I had to guess the original file was generated for web use only and wasn’t natively intended for applications where high resolution is necessary. This is probably fine for website icons and printed flyers but a printed shirt graphic at 9.5 in wide, I don’t think so. That’s where our graphic design services come in, we take your art file and recreate it at a suitable resolution. This type of design work is relatively simple and generally costs less then $80, once finished we deliver that file to you for use in other applications like signage or stickers. Above we have a similar example to the Garfield project but here the customer needed to create the art from a concept. 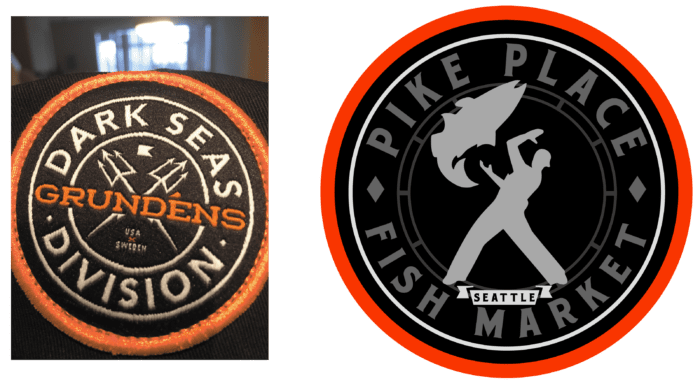 Our friend Jaison from Pike Place Fish Market sent us a picture of this hat patch he really liked and asked is to do something similar with his art. That’s where we came up with the design on the right. There were a few revision but something like this is about 2 hours of graphic design. Another advantage to using our services in this circumstance is we can optimize the art for the decoration system so you know you’ll get a quality end result. When working with a graphic designer it’s always a good idea to have a clear idea of what you want and know how to convey that information effectively. We recommend that you browse the web for like examples or take pictures of inspirational content to send in aid of the project. Also please try and be easy to work with, as contract artists we want to make your project awesome but that can be difficult when the customer is constantly changing their mind or slacking on communication. You’ll get a lot more bang for your buck if you’re willing to put a little work into making sure the artiest has everything they need to do their job. Taking the time to make sure the art file is setup to be compatible with screen-printing or embroidery and is in an optimum resolution will make all the difference.